On first glance, the Topp Twins almost seem like a joke, an outlandish skit concocted by writers for SNL or Funny or Die. As one interviewee puts it - on paper they're "commercial death." 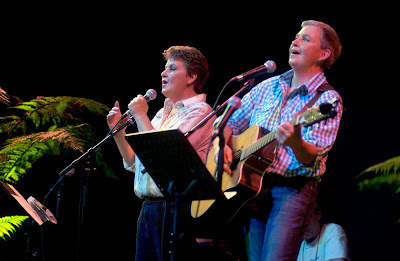 But these twin yodeling lesbian comedians from New Zealand are as real, and as genuine, as they come. 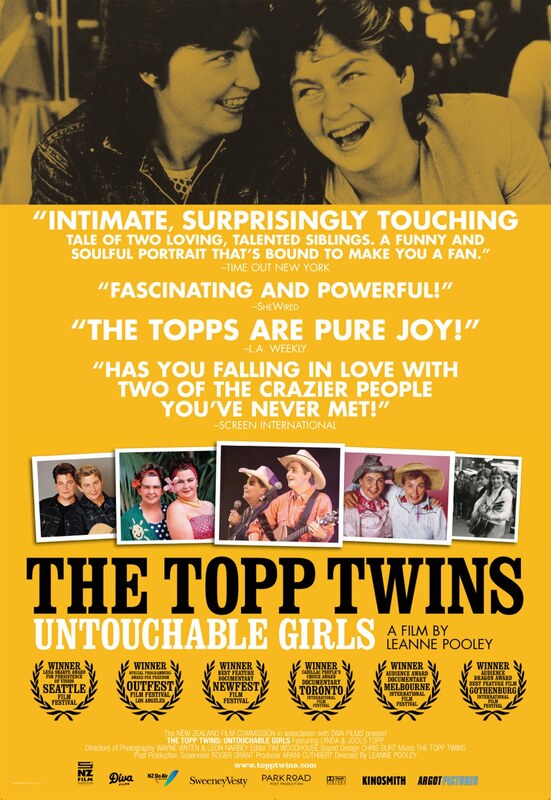 And in Leanne Pooley's altogether charming documentary, The Topp Twins: Untouchable Girls, the twins' irrepressible spirit shines through. Something akin to a Kiwi version of the Smothers Brothers, the Topp Twins, Jools and Linda, have been performing together since the early 1980s, where they often performed at political rallies and were very active in various causes, from gay rights to nuclear disarmament. And they always did it with their own unique brand of humor and heart. While they are huge cultural icons in their native New Zealand, here in America they are relatively unknown. And even though some of their political efforts in their homeland may not necessarily translate to American audiences, their appeal is nevertheless universal. Jools and Linda Topp. Photo by Sally Tagg.© Diva Productions, Courtesy of Argot Pictures. Spreading their act and their message beyond New Zealand is one of the primary goals of Untouchable Girls, which sets itself up as an introduction to this cheerful comedy duo. Through extensive interviews with the Topps themselves, as well as friends, family, and even the characters that often show up in their act, such as Camp Mother and Camp Leader, the Kens, and the haughty society ladies, Prue and Dilly. Pooley provides a window not only into their lives, but into their creative process. The Topps speak candidly about their past and their sources of inspiration, guiding us through how they originated the characters they have become so loved for. These ladies aren't just about the laughs, however, and their act often turns serious as they tackle issues near and dear to their hearts. The film also takes a dark turn when Jools is diagnosed with cancer, taking their relationship into a whole new realm of devotion. Pooley wisely avoids pushing the film into sentimentality, allowing the twins' indomitable character to carry the film, and it pays off in spades. Jools and Linda Topp. Photo by Sally Tagg. © Diva Productions, Courtesy of Argot Pictures. It's difficult not to get swept up in their story and carried away by their effusive charm. They're raucous, good-hearted brand of humor washes over the audience in a warm embrace, a quality that is rare in a world where sarcasm and irony are often the driving force behind comedy. The Topps are a throwback, and Pooley's buoyant film celebrates them as a comedy act to treasure. It's the kind of film that lifts you out of the theater on a cloud, balancing humor and pathos with nimble aplomb. 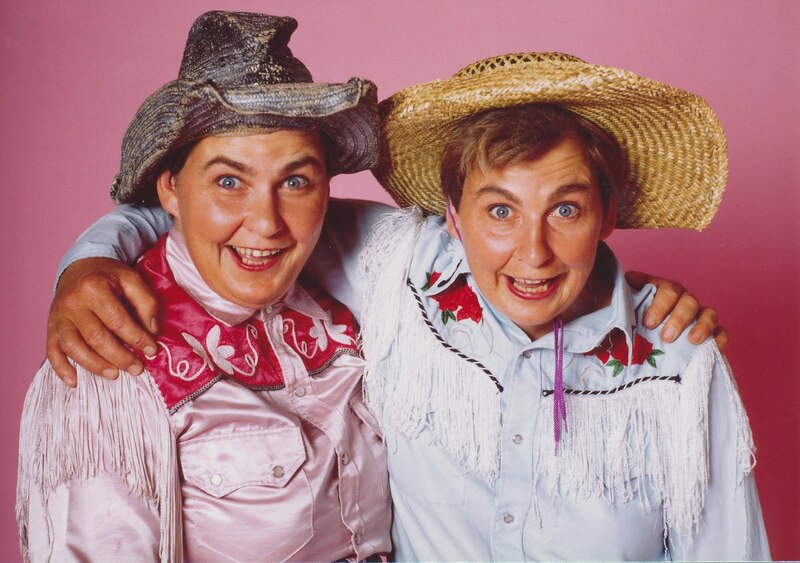 You've never met anyone quite like the Topp Twins, and are unlikely to ever again. The Topp Twins: Untouchable Girls is a testament to their talent, and a vehicle to deliver their message to a whole new audience. It's a rare, purely fun documentary with a purely fun subject that reaches both the funny bone and the heart in equal measure. Sound corny? Perhaps. But Jools and Linda Topp are a special pair worthy of a special film, and Pooley delivers. No great issues here, no profound statements, just an oasis of joy in a sea of cynicism. The Topp Twins are here to stay. 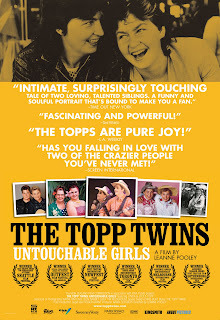 THE TOPP TWINS: UNTOUCHABLE GIRLS | Directed by Leanne Pooley | Featuring Jools Topp, Linda Topp | Not rated | Opens Friday, May 13, at Cinema Village in NYC.